Paxton Manor’s My Bloody Valentine event is trying to put the extreme in “extremely romantic” this Valentine’s Day weekend. WASHINGTON — The Valentine’s weekend tour at Paxton Manor seems to have all the ingredients of a romantic date night in Leesburg, Virginia. For starters, the Victorian house is getting “dressed up” for Valentine’s Day. Its lights will be turned way down low, leaving cuddling couples with a single rose to light the way. And let’s not forget the people dressed up as creepy dolls and clowns jumping out at you. “When you think about it, it’s extremely romantic,” says Katie Loudermilk, an actor who’s part of the tour. 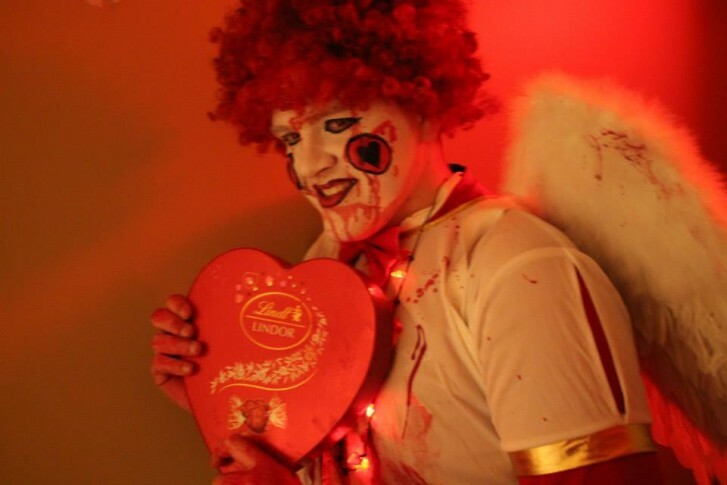 The folks at Paxton Manor — the same ones who produce the Shocktober haunted house for Halloween — really are trying to put the extreme in “extremely romantic.” They’re bringing back its Valentine’s weekend creepfest, My Bloody Valentine, for a second year. Hugs and screams are part of what keep Joe and Emily Germano, of Leesburg, together. Joe Germano, 46, says they’ve been to at least two dozen haunted houses since they were married in 2001. Emily Germano, 43, says it took some getting used to. “I’m definitely the supportive wife,” she says. The couple made a trip to Paxton Manor for last year’s Bloody Valentine and they’re looking forward to going to this year. Built in the 19th century, Paxton Manor claims to be “the only real haunted house in Northern Virginia.” It’s frequented by ghost hunters who claim it’s a “very, very, very active house in the paranormal realm,” according to Loudermilk. The manor’s namesake, Rachel Paxton, turned the home over to Leesburg when she died — under the caveat that it be used to help children. Today it’s the site of Paxton Campus, an institution that serves children with special needs. My Bloody Valentine is a fundraiser for the campus. “It raises a lot of money for something I’m so passionate about,” said Loudermilk, a behavior analyst and testing coordinator at Paxton. Jennifer Lassiter, executive director, said the inaugural event raised $15,000 and fetched 500 people over the course of two days. Organizers are hoping to raise even more funds by expanding the tour to three days.